Bling alert! I’ve found a new go-to for super cool jewels! Delicate and ladylike, but with a modern edge, The Peach Box is an Australian online jewellery and accessories store specialising in effortless, timeless yet trendy pieces. With everything from glam statement earrings to chic watches at great prices, it really is a bling fans dream! I was kindly approached to check out the brand for myself, and I’ll admit I struggled to narrow down my wish list when asked to pick a few pieces from the label, but finally settled on the Roman Empress Bangle in Rose Gold ($45 – shop here) and Radiant Crescent Earrings ($38). Both statement pieces in their own right, I’ll admit I chose them due to the rose gold factor – I’m a huge fan of the trendy metallic hue! The Radiant Crescent Earrings are what my girl Kimba Likes likes to call “tough pretty”. Unique and cool, I fell for the bold combination of lady like pearls against spiked metal. 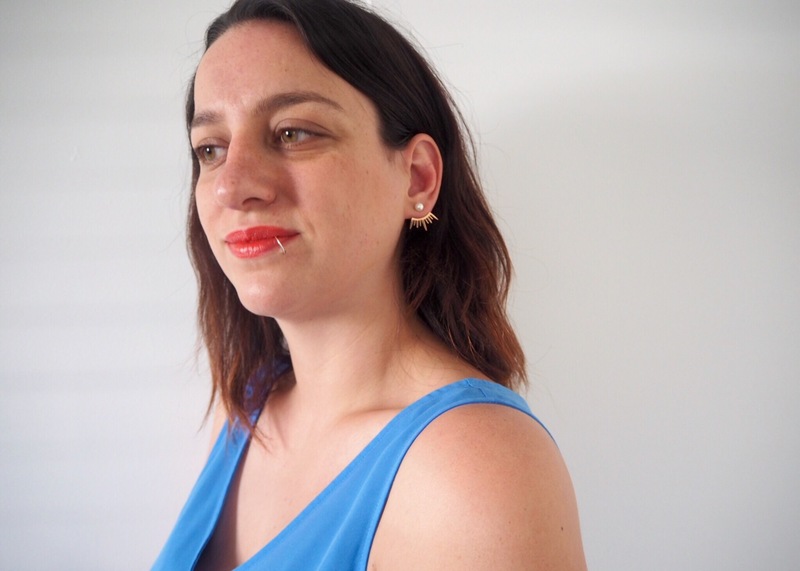 They are so different to all of the other earrings I own and exude a tough yet chic vibe. 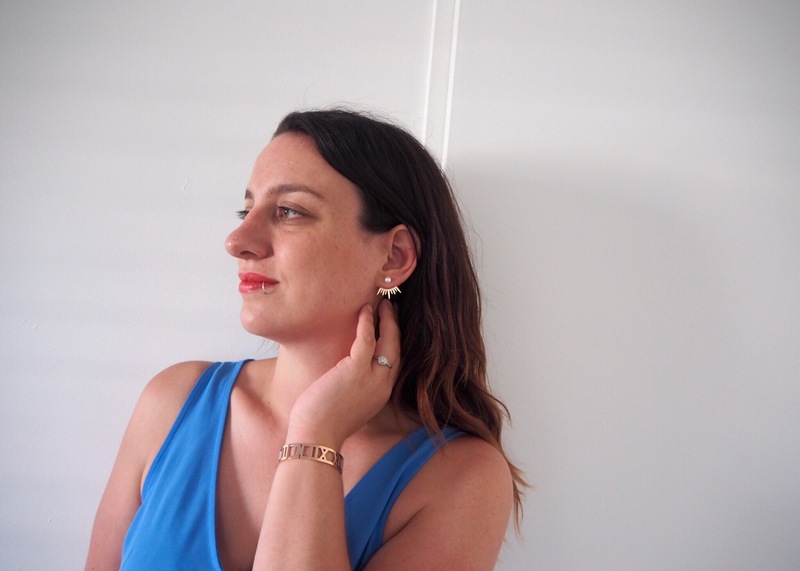 The rose gold metal is very on trend, and the earrings look great for both work and play. Unfortunately they are currently sold out online, but The Peach Box can notify you via email if they restock. Available now and something totally different, the Roman Empress Bangle is the epitome of vintage elegance. The 18k rose gold band features a quirky, old world design, perfect for the “retro” lovers like this girl. I can’t quite say I’ve seen anything like it! Like the earrings, the bangle can be worn for work or play, and looks so beautiful on its own or stacked alongside mixed metallics. It’s a total statement and I can’t tell you how many questions and compliments I’ve had on this one. If you’re a fan you can shop the bangle, and the same design in different metals now. When styling the pieces to share with you guys I let the jewellery do the talking and kept it simple with my clothing choice. The bright blue of the blouse works beautifully with the rose gold and compliments the colouring. A pop of colour on my lips completed the look (and jeans of course, not pictured). When wearing bold statement bling you don’t need to fuss too much with your outfit, which is why I love The Peach Box – the accessories do the talking! It’s a lazy dressers dream store! The Peach Box is currently offering free Australia wide shipping for purchases over $50 or if you sign up to their VIP list you can score 15% off your first order. Incentive much? Do you like rose gold? Are you a fan of letting your jewellery do the talking? * I accumulate a bunch of PR samples and gifted product thanks to the blog, and I like to try out and test what I receive, sharing the best bits with you guys so you too can discover new brands and services. I will only share the products I have faith in and actually love as per my disclosure policy. The Peach Box jewellery gifted for my review. All opinions are my own. Just love those earings, they’re great ! They’re super cool hey T! Something a bit out there! I love rose gold. Those earrings are so unique, I love them! Aren’t they just ! Rose Gold is such a nice change from regular gold. Love it! Love your rose gold choices! Those earrings are so beautiful and versatile! Thanks Kez! Unlike anything else I have! Previous Post#BOOKWORM | Five books to read right now!